During the Victorian era, a plethora of objects became the rage when it came to meal service. Every function needed it's own tool. There were slotted spoons for serving tomatoes, salt cellars for each setting, and beautiful containers for butter. Yesterday we were invited guests to the home of friends and our hostess served Earth Balance spread for the Artisan Bread I took along as my contribution to the meal. 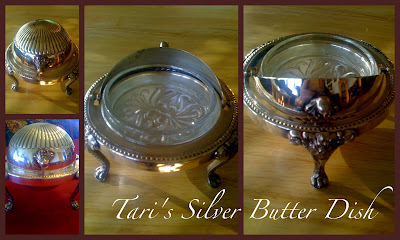 Instead of keeping the spread in it's plastic container, Tari arranged it beautifully in this silver butter dish that was given to her by her mother. Isn't it lovely and unique? A family treasure passed down from mother to daughter. . .
My goodness! You've been doing some sPrInG freshening here. It all looks great! You really made my eyes widen this morning and I truly had to check to see if I knew where I was. LOL! Yes, a beautiful presentation is worth almost as much as the delicious food. Oh look at your pretty new presentation. I like it. That butter dish is so lovely.